Chinjury. I bet you’ve never heard that word too often? The Urban Dictionary says it’s applies to when you fall over and hit your chin. Yeah, that’s all very good, but I’ve got a far better variation of it, after something which happened yesterday. I’d completed a day walk and whilst on my way home, I suddenly realised I’d forgotten to eat any food for the day, other than the world’s smallest apple. This was clearly insane, so I stopped at a sleepy country town, found a chicken shop and promptly ordered big. Being way too far from base camp, I decided to plonk myself on a seat and began to inhale the contents crammed into a Styrofoam box. Firstly, I was intrigued by the chicken which appeared to be circa 1975, due to its distinctly leathery texture. Are you wondering where this is going? Don’t worry, I’m about to tell you. I had my food box on my right and I was leaning across to select slabs of food with my bear paw in order to hurl into my mouth. As I was doing this, I felt a twinge on the lower left side of my back. Damn. All that leaning to my right had put my back out. Yes, I officially had a chicken injury, or as we now know, a chinjury. It’s a rare condition, but I’m telling you, it now exists. Now, what’s this post about? It’s actually a tale of two entries really. The other day I wrote up a full spiel about a pair of boots I’d worn for the past two years. It detailed quite a saga, but upon finishing the entire write-up, my brain was officially somewhere else, as I deleted it by accident. Huh? How does that happen? Don’t ask, but all you need to know is I did. I considered re-writing it, but really, it’s a tall ask, so I’ve elected to recall bits of what I wrote, tap them out and get the thing over with. Was this going to be a gear review? No, not really. It was only a pondering of an ongoing shoe drama, which I’ve had over the past few years. I’m always amazed how many types of footwear there are, yet none fit me. The main reason is simple. I’ve got wide feet, but this shouldn’t be too much of a problem, as a few companies make such a boot. EXCEPT THEY’RE NOT AVAILABLE IN AUSTRALIA. Phew, glad to get that off my chest. There’s something to be said about living in a country which is miles from anywhere and with no one in it. The market is too small? Who knows. When I kicked off hiking a few years back, I went for the traditional leather boot. You know what? After five years, the sole might be worn down, but they’re still going strong. Yeah, I’m aware they’re a bit heavy though, so I’ve attempted to embrace the lighter footwear train. I’ve tried them all. Runners, trail runners, Gore-tex, non-Gore-tex, mids, whatever. Some have been great, except for one problem. Most haven’t been wide enough and I’ve compromised the fit. What was the solution? 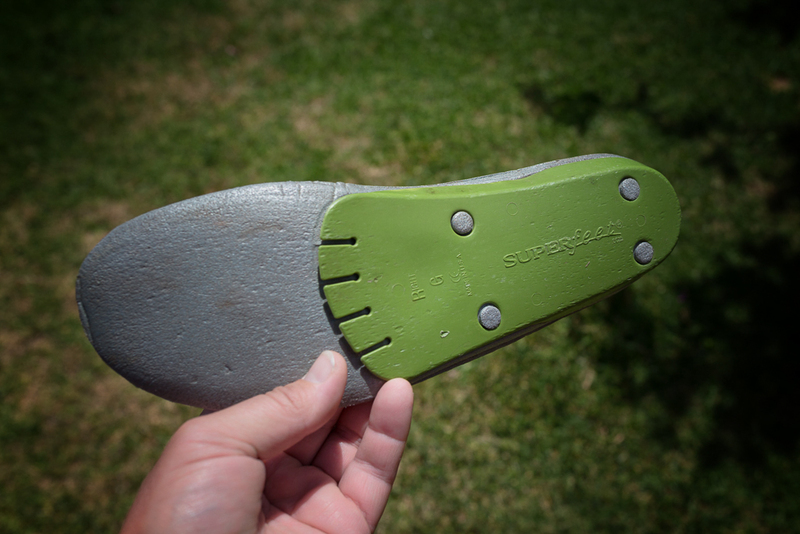 I researched the guts out of the outdoor shoe world. In the end, the Merrell Moab Ventilator Mid boots (yes, I’m aware of how dumb that name is) kept coming up. It seemed to fit the bill for me. Lightweight and no wear-in time. I still prefer to have my ankles covered, so that was good, but best of all, they have a wide fit. Oh, but of course the wide fit is not available in Australia. Talk about a ball breaker, but I wasn’t deterred. In the end, I took a punt and stumped for a pair online and within a month they duly arrived. How were they? I must say it was quite an enlightening feeling, wearing boots which actually fit, instead of having my feet crushed at the sides. There was minor problem though. I was wandering around and I noted something. It appeared I could feel every minor object on the ground through the sole. Mm… Investigating further, I examined the insole and concluded they appeared to be an afterthought. They’re so thin, I’m sure you could see through them if you held them up to the light. 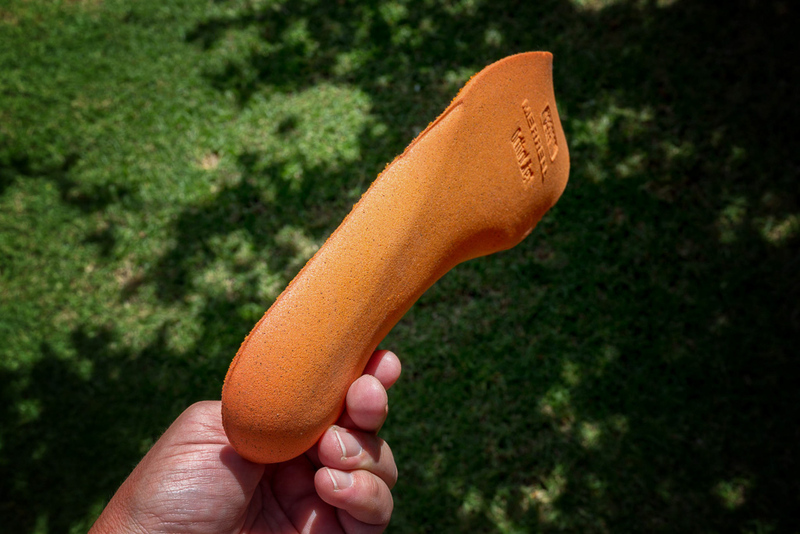 Merrell insole. So thin. So light. So crap. …and they’re green. You know what? They’re pretty good, as they give a reasonable arch support, which is rigid. I’ve used them for the past 18 months and they’ve barely shown any wear or tear, so they must be doing something right. Ah, but it doesn’t end there. 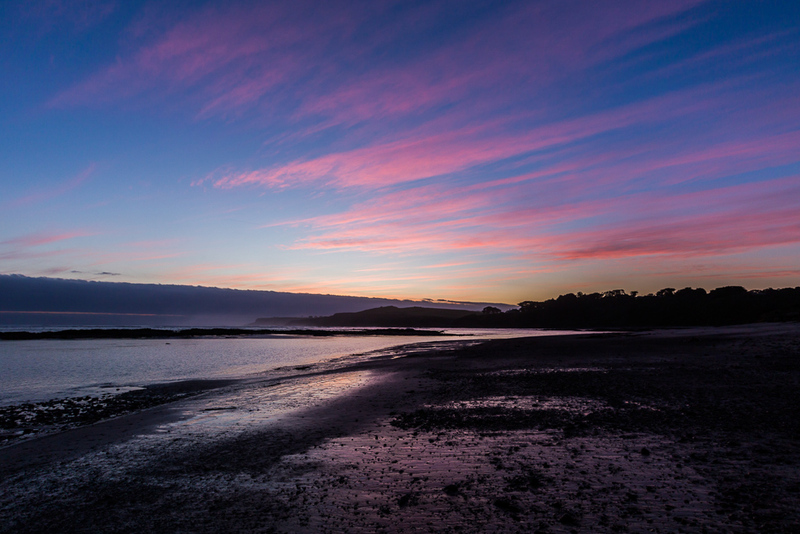 A month ago, I spent a day walking on hard sand and at the end, my feet were killing me. I considered whether some custom orthotics might be a proper fix, so upon my return I went to Mr Podiatrist. He decided I should try custom insoles, but not the rigid, top of the range style, as they cost too much. He suggested something called ‘Joeys’. Joeys orthotic. In a lovely shade of blue. Oh, but these things were $340, so they’re not exactly bargain basement in price. I guess this is cheaper than the stronger type, which Mr Footman says would stitch me up for about $500 – $600. He could be talking crap, but what do I know? I went with his suggestion, but there’s a problem. 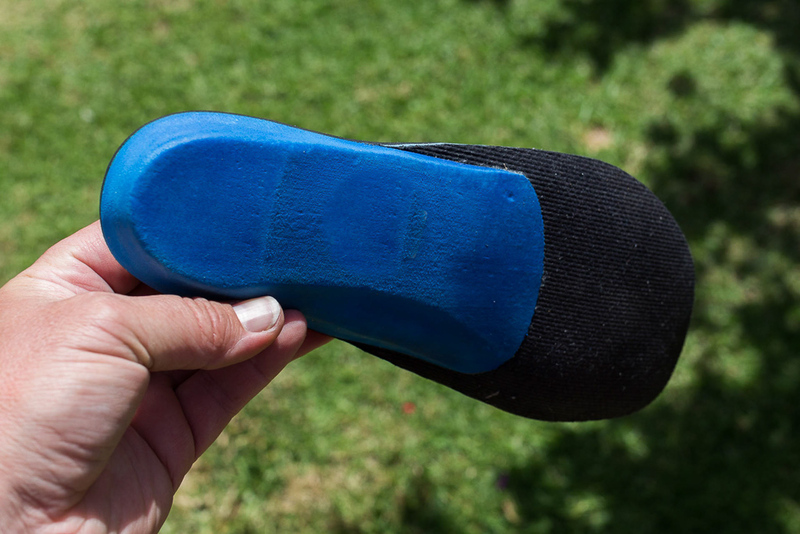 He said the insole would last only 12 months or so, but if the Joeys worked okay, I could get some more rigid ones cast. I’m sure I saw his eyeballs rotating dollar signs and lemons as he said this. How have they gone so far? Well, I must say, I got them home, read some accompanying instructions, which specified things such as, ‘wear them initially for one hour a day’ and ‘don’t wear them in exercise footwear for a month’. I sat back in my chair, pondered what I’d read and promptly ignored it. I stuck them in the Merrell boots and went for a six hour walk. Yeah, I know, there was a potential fiasco on the cards, but in the end, they felt fantastic. After a number of hours strolling in a dry river bed and stumbling through uneven ground under long grass, my feet were feeling great. Mind you, my feet were, but not the rest of my body, as it was 33 C and everything above the ankles felt like it was going to pack it in. Anyway, the most important aspect is they were a great success. Except things can’t be great all the time, can they? I’d spent six hours wandering and was walking through bush with literally only 200 metres to a road and conclusion of the walk. My feet were feeling great and I was thinking how amazing the Merrell’s were when my toe snagged a dead tree branch. The large stick may have been lifeless, but it still packed a bit of mojo as it promptly speared through the leather toe cap of the boot. Is this possible? Yes, of course it is. Damn. It kinda ruins the shoe, doesn’t it? Having a huge hole in the toe? Instead of leather, if only they’d been made the protective toe cap out of the country town chicken I ate yesterday, as I’m sure the branch would have bounced off such leathery meat. Anyway, are they knackered? Probably, but I’ll wear them for a bit longer until they finally fall apart. So, that’s where I stand in this shoe saga. A pair of damaged boots, but the feel of the Joeys has opened up a few more possibilities. I have a pair of Asic runners, which have been on the back burner, but their fit isn’t too bad, so I’m contemplating sticking the new insoles in them and seeing what happens. One day I’ll sort this footwear business out. One day. So there you have it. The original post had a lot more in it, so deleting it by accident wasn’t the greatest idea. Anyway, this’ll do for the time being. What’s coming up? I’m not sure, but I was contemplating changing tack for a month. How’s this for an idea? Instead of writing the usual guff, I’m considering posting a picture a day for however long I can be bothered. Ten days straight? Twenty? Maybe the full month? The idea came about, as I’ve noted I’ve been pretty lazy with the camera lately. The idea being it’ll force me to get out and take a photo a day. That’s all the post will be. Some sort of image. It could be from a walk, the city or anywhere really. I can’t guarantee it’ll be taken the day of the post, but mostly they will. So, if you suddenly start seeing a post a day, rest assured, it’s only part of an experiment to get me back into blogging and fire up some enthusiasm for blogging in general. Mt Donna Buang, Victoria. October 2014. I feel your pain as I was also dealt the wide-foot card. Every January as the new school year approached and the holidays drew to a close we had the usual school-shoe-shopping-saga, and I've heard many a sales lady murmur to my parents, "she HAS got WIDE feet, hasn't she? ", which was the source of much embarrasment for me. I eventually gave up wearing women's hiking shoes/boots when I tore off my latest pair of new shoes as we hit the fire trail on the last stages of an overnight hike, and I completed the walk in my tevas (socks and sandals never felt so right!). Now I buy the men's Merrell Moab Ventilators shoe and also have the gortex one, which I need in the next size up strangely, and have found blissful comfort. My partner bought them also and complained about the thin insole, so replaced it, but my newest pair seem to have a more robust one which is fine. They wear a lot quicker on the sides than other shoes, as you have noticed, and let lots of sand slip in through the mesh top, but I'll put up with this for the comfort "straight out of the box". 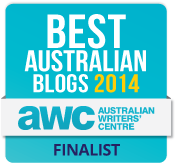 You have been much quieter on the blog this year – should we expect the book any time soon??? Well, I hope you have continued success with the new inserts. Just changing to better quality trainers (I use ASICs too) after years of wearing cheap and nasty footwear made a huge difference to my comfort, not only in my feet, but also my knees, hips and spine. However, now that I am getting older but doing even more walking I need more support so will look into your choices of footwear and inserts. I also have wide feet and so do my kids so shoe buying can be very expensive and frustrating. After years of problems as a kid I thought about becoming a podiatrist. Perhaps if I had, I'd be making enough money to travel the world now, instead of mainly doing walks in SE QLD. Anyway, I am very happy to hear you've had relief with these new inserts. Let's hope that means you can keep hiking for many more years to come…or maybe start running again? Hi Sue, thanks for your comment and I have empathy for your problem! It's funny how there are so few wide-foot options out there. Only after doing some research did I find the boots exist, but they're all overseas! Vasque is another one. I recently got a wide fitting shoe from them, which obviously you can't get here either. They're not too bad so far! I did consider the Ventilator shoe and as you've said, they sound like a winner. I do like my ankles covered though, for whatever reason. Probably a misplaced feeling that I've got more protection when I bang them against rocks etc. What you say about the inner is interesting. I assumed the inner was lousy, as it's a way to cut costs, so I'd like to see their new type. It goes to show though, most of these shoes have a rubbish inner, but other than my orthotics, I can definitely recommend the Superfeet range, as they're sturdy and durable for something which costs $50. Yes, the ASIC's were again bought from overseas, as the wide foot model wasn't available here. A complete pain in the arse, as taking a punt on footwear is a problem. I've been caught out a couple of times by shoes sizes, which do not replicate to what I usually wear. As it is, I wear anything from a 46 to a 49, which is ridiculous, as my feet don't alter that much! Yeah, it's an age thing for me. Once I had size 11 shoes for about 20 years, but as I've got older and heavier the arches have flattened. There's no way in a million years I could fit into any of my size 11 boots which I wore years ago! Wow, I thought I had wide feet (helps you grip the ground better) but if I can fit my tradition leather La Sportiva (mens) hiking boots well, then maybe not. Mind you, I can go regular shoe shopping in a regular shop. Too big feet for that. We also use Super Feet. Have for years, even though our boots have decent soles. They add good arch support. Watch out for that hole in the toe Greg….amusing as your posts always are, I don't look forward to read how you've injured your toes because something got in! Correction: *can't* I can't shop for shoes in a regular shop. 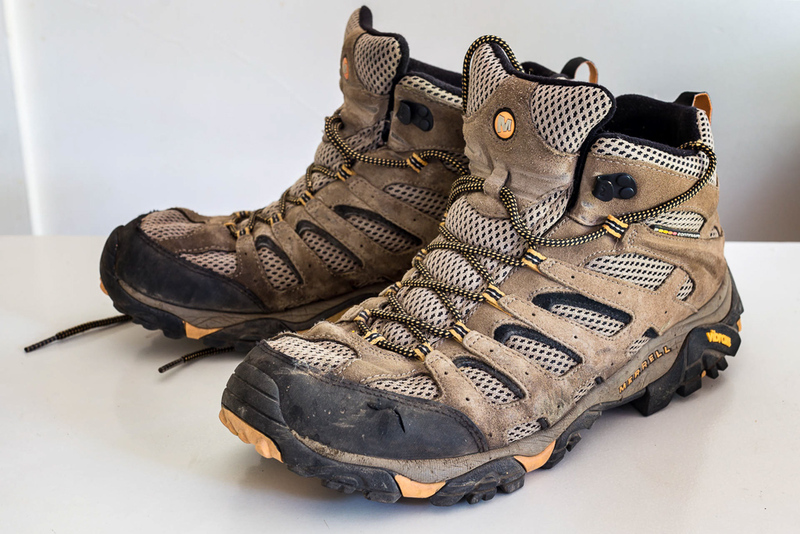 Well, the leather boots I mentioned in this post are La Sportiva, so there you go! I think they're the Tibet or something similar? Anyway, I love those boots and they've been to so many places, so how could I ever get rid of them? I do get the weight business though, so they might not get out as much as they once did. When I did the GSWW though, they were bullet proof, so maybe on the longer the walks I might dust them off again. Yeah, Superfeet are great! I was a little dubious at first, but I can't knock their durability. Mine were still going strong after a few years. I was due for orthotics though, but if I was strapped for cash I could have stuck with the Superfeet for a lot longer. Just a word of warning against using the ASICS in any serious bushwhacking. They seem to lack grip on steep descents, and the lightweight uppers suffer seriously when exposed to all the sticks and things one encounters in the bush. 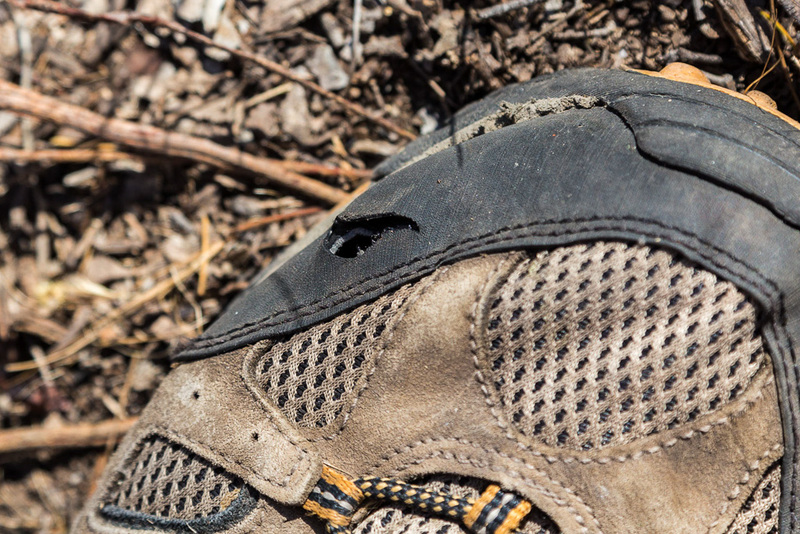 I used a pair in an ascent up an untracked spur on The Terrible Hollow near Mt Hewitt and they got torn to shreds. BTW, taking a shortcut in the Terrible Hollow is just as crazy as it sounds, at least until the undergrowth thins out a bit after the regrowth from the last fire in the area. Yes, you're very much correct! A pair of ASICS might be fab for nice tracks, but one hint of bush and who knows what'll happen to them! Even the Merrell's in this post is an example. That dead stick just speared through the toe without much force at all. It shows that sometimes a nice leather pair are a better option for a bit of bush bashing. Yeah, I'm just picturing the Terrible Hollow and I don't think I'd like to find out what a shortcut would be like through there! Certainly bushfire regrowth changes what a walk entails.